…in the middle. On April 10th 2014 I was sentenced to one year in jail to be served at the Regina Provincial Correctional Centre (RPCC). With time off for good behaviour, I was expected to serve 8 months, but due to circumstances and some good fortune and the intervention of my Lord and Saviour Jesus Christ, I was released one month early after serving only 7 months. I am not a bad person, I just made some really bad choices, and those choices cost me my freedom, my relationships with family and friends, but it also gave me the opportunity to reflect on life and make the changes required to save me, both in this life, and for all eternity. My first encounter with God in jail, was when I approached the book shelf and found a number of books, with blank spines facing out. 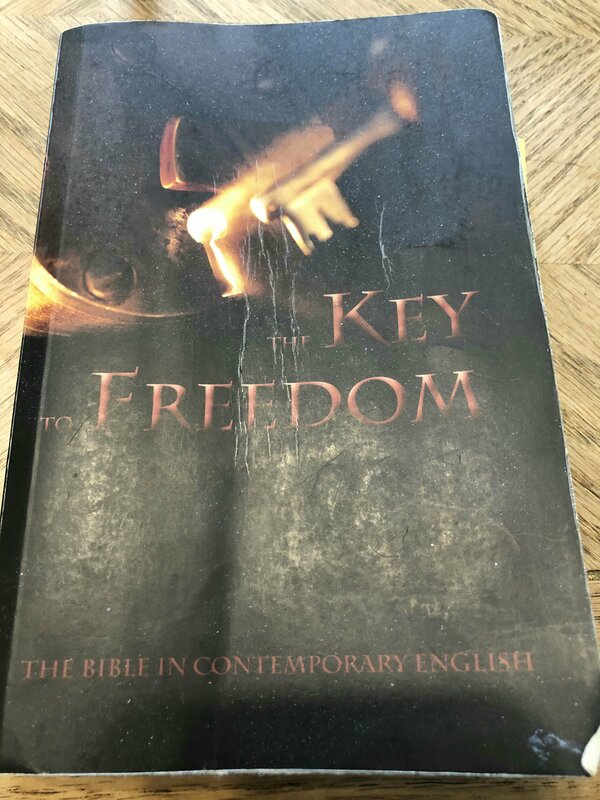 I pulled one from the shelf and was found to be holding The Key to Freedom, a Bible in Contemporary English. I found this Bible about 10 days into my stay. I’ve always been a superstitious person (not so much now) and could not for the life of me replace that Bible into the bookshelf once I had taken it. I chose instead to take it to my cell and glance through it. I’d had exposure to The Bible in the past and had read through it, but didn’t really understand it. After a couple of days of light reading, I found a “read The Bible in a year” section, and I decided to read through it before I was released. This was a challenge only to myself, and didn’t really mean anything special (at that time)! God had other plans though! I got more and more into the Book and began to discuss my findings with another inmate, Donald. He was very devout and helped me to read and understand the Bible. We talked, along with other inmates about the various things we found and understood, or didn’t understand. We debated various verses and chapters to help us understand. The Contemporary English Bible is in plain English and very easy to understand. Especially when compared to the standard King James Version that everyone grew up on. I was finally beginning to grasp what it was all about. Everyday I would spend about 2 hours in my cell reading my allotted chapters and verses, along with other materials I was able to get hold of. My appetite for God was immense and it would only get stronger, as my 50th Birthday (to be spent behind bars) approached.